Lack of power supply in USB port, which writes error message into the area. When you get stuck on these problems, take it easy and keep in mind that do not write any new file to the USB stick. This will increase the likelihood of USB file recovery. 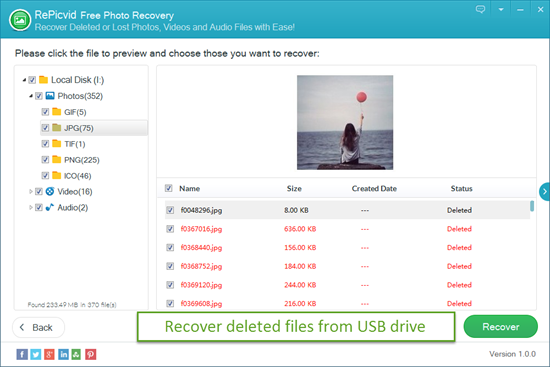 Here, RePicvid Free Photo Recovery, a professional USB Recovery tool, would get you out of the trouble. 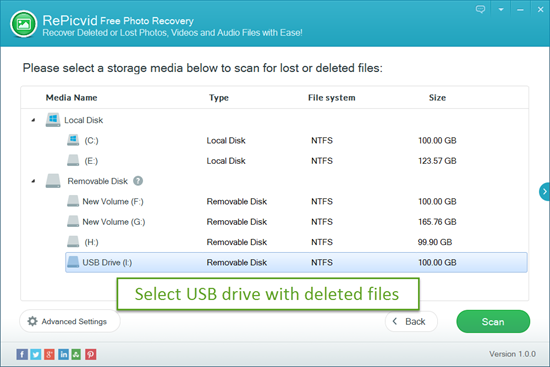 It’s able to recover more than 50 formats of files like photos (free), videos, audio files, documents from USB drive. Just download it and have a try! After you download and install the USB file recovery tool, insert USB drive into the port of computer, then get started as following steps. Choose “All File Types” for recovery and then Click on the USB drive that contains deleted files. In “Advanced Settings”, you could select those common file formats you want and. Then, click “Scan” to explore all files in the USB drive. After the scan stops, preview the thumbnail of deleted files and pick out those you need. At last, recover deleted files from USB drive and save them onto local disk. Plug USB drive to computer and double-click “My Computer”. Select the USB drive and right click it. Choose “Properties”. Select “Tools” tab and check button. After doing the above steps, select “Scan and fix”. 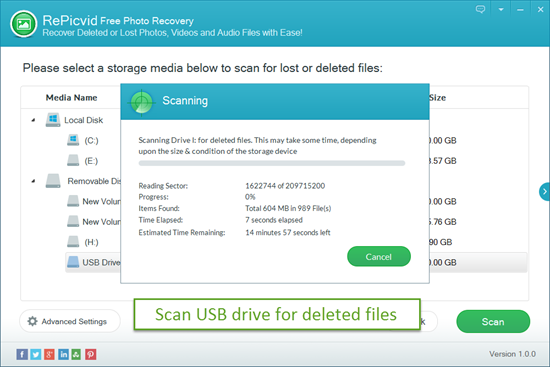 If USB drive stores vital data, try RePicvid Free Photo Recovery to restore files. Right-click on the USB drive, and choose “Format “. In the open “Format removable disk” window, uncheck the “Quick Format” item and click the “Start” button to format the USB drive. After connecting USB drive to computer, click “Start” and ”Run”. Click “Enter” and wait for several minutes for the formatting.